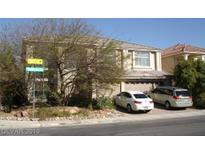 Below you can view all the homes for sale in the Carmel Hills subdivision located in Las Vegas Nevada. Listings in Carmel Hills are updated daily from data we receive from the Las Vegas multiple listing service. To learn more about any of these homes or to receive custom notifications when a new property is listed for sale in Carmel Hills, give us a call at 702-323-5933. Heat shield in the attic keeps this home energy efficient. Professionally landscaped. Convenient Location! ! MLS#2088153. Resolution Realty. Bedrooms are generous in size .Covered patio and lush landscape in front and backyard . This is a must see! MLS#2085109. Redfin. SS appls.,(Frig will stay) pantry, trash compactor & breakfast nook*Separate laundry rm & the washer & dryer stay*Formal dining*Tile floors*Shutters & 2" wood blinds*Needs TLC MLS#2080378. BHHS Nevada Properties. 5th bedroom upgrade during build of home. A Must See! MLS#2079350. Realty ONE Group, Inc. THIS UPGRADED TURN-KEY HOME OFFERS YOU THE PERFECT OPEN LAYOUT WITH **5 BEDROOMS | 3.5 BATHS | 2 CAR GARAGE | DOWNSTAIRS EN SUITE FOR GUESTS | OVERSIZED GRANITE KITCHEN ISLAND | WALK-IN PANTRY | TILE & LAMINATE WOOD FLOORING | MASTER BATH W/ LARGE SHOWER | SPACIOUS ROOMS | COVERED PATIO | ALL APPLIANCES INCLUDED** Located near freeways, walking distance to the Target shopping center with restaurants, shops and various amenities! MLS#2076392. O48 Realty. And Much Moor!!! A Must See House!!! ! MLS#2065694. City Villa Realty & Management. WOOD FLOORS, tile and upgraded carpet*2 balconies*formal living and dining*family room w/surround sound*gourmet kitchen w/GRANITE tile counters, island dining, butler’s pantry STAINLESS appliances included*MOVIE ROOM*tech loft*covered patio w custom deck*fresh paint*master on ground floor MLS#2047197. Polaris Realty.